The much-anticipated Iraq Study Group led by former Secretary of State James Baker and former Democratic Representative, Lee Hamilton of Indiana, released its findings on December 6, 2006. Although the geriatric panel lobbied some tough criticism at the White House and Pentagon, its findings, supposedly delivered after the midterm elections to avoid injecting domestic politics into it (like politics can be divorced from it), are already outdated given the rapid escalation into violence and chaos in Iraq. 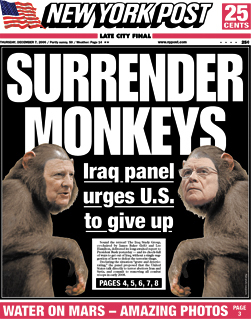 Nonetheless, it did call for U.S. combat brigades to be withdrawn from Iraq by early 2008, which in turn led the mentally retarded apes at Rupert Murdoch’s New York Post to conclude that Hamilton and Baker were “surrender monkeys" -- their brazen headline accompanying quite possibly the worst Photoshop image ever produced.